Every once in a while I decide to play Phase Shift (very similar to Guitar Hero). I might go weeks or months between plays, but when I return, I often break a high score within the first few songs I play, even on songs I've played tens of times before. After about half an hour of play, my skill seems to drop off and I get average to low scores. To me it appears that practice in the distant past (> 1 week) increases skill, while practice in the immediate past (< 1 hour) decreases skill. Is there any proposed explanation for this effect? Are there studies that measure it, and if so, what activities were used? I don't play any musical instruments, so I'm also curious if this happens for real music as well. Long-term memory formation (consolidation) takes weeks, or even years. Unfortunately my observations haven't been published yet, but an interesting thing I see with listening tests in noise is that people are systematically performing better when they come in a week later for a re-test. 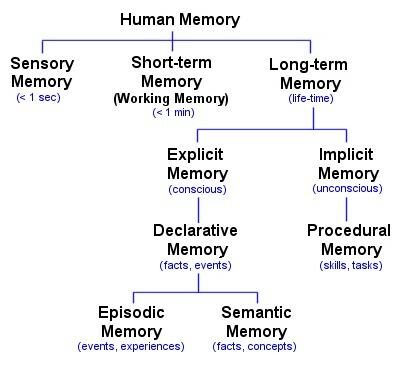 Now I'll add some background information about types of memory as a general answer (Fig. 1). It includes such arbitrary matter of understanding the test (listen and repeat sentences / play a game) and other when subjects perform a certain task for the first time. Memory consolidation is defined as a time-dependent process by which recent learned experiences are transformed into long-term memory, presumably by structural and chemical changes in the nervous system (e.g., the strengthening of synaptic connections between neurons). Consolidation stabilizes memories after initial acquisition. Synaptic consolidation is the same as long-term potentiation and occurs within the first few hours after learning. Systems consolidation is the process where hippocampus-dependent memories become independent over a period of weeks to years. After a while of playing and being past your peak, you may simply get tired, bored, or loose focus for other reasons, which reduces performance. Not the answer you're looking for? Browse other questions tagged neuroscience learning memory performance video-games or ask your own question. Why do dual N-back games use certain letters? What is an explaination for the light-headed and slow-motion feeling after a long hard mental exam?